Environmental benefits of riparian forest buffers (trees located along streams) are well documented, yet an understanding of factors influencing landowner adoption on properties adjacent to agricultural fields is limited. Reasons for adoption and non-adoption were examined using survey data collected from landowners in Kansas’ Tuttle Creek Reservoir watershed, an area of high concern for water quality and quantity. Survey questionnaires focused on four latent adoption factors: attitudes toward trees, economic motivation, knowledge of riparian forest buffer benefits, and perceptions of government-funded incentive programs. Responses were analyzed with Spearman’s correlation coefficient to determine whether relationships existed between landowner type and each latent adoption factor, Cronbach’s alpha for scale reliability, and the Mann–Whitney U test for differences between adopters and non-adopters. 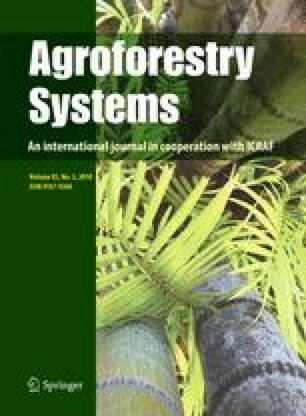 Significant differences between landowner types were revealed indicating that riparian forest buffers were not likely to be adopted if landowners had unfavorable attitudes toward trees, were motivated by economic factors, were unaware of riparian forest buffer benefits, or had negative perceptions of the current design of government payment programs for establishing trees in riparian areas. The following themes were identified for their potential to increase adoption: riparian forest buffers need to be perceived as profitable; opportunities exist for education; financial and technical resources represent major constraints to riparian forest buffer adoption; and there is an apparent need to create awareness of financial assistance programs. Research conducted by this study received approval from the Institutional Review Boards at the University of Missouri (Project #1207631) and Kansas State University (Proposal #1207631) prior to survey administration. All survey recipients were notified that participation in this study was voluntary and that responses would be kept confidential.